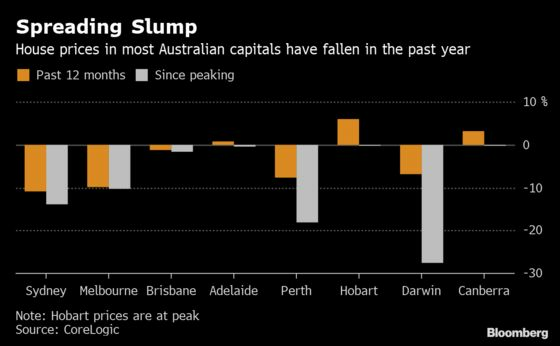 (Bloomberg) -- Australian property prices continued their slide last month, as prospective buyers delay purchases until after national elections, and tougher lending standards make it harder to obtain financing. Housing values in the combined state and territory capitals fell 0.7 percent in March, to be down 8.2 percent from a year earlier, according to CoreLogic data released Monday. The nation’s two biggest cities remained at the forefront of the slump. Sydney prices fell 0.9 percent last month, and are now down 13.9 percent from their mid-2017 peak, while Melbourne values dropped 0.8 percent to be 10.3 percent below their peak. While nationally the pace of declines is slowing, the downturn has become more widespread. Prices fell in most regional areas and six of the eight capital cities last month, with only Hobart in the black (Canberra was unchanged). The housing market may remain lackluster in the run up to national elections expected in May, given the main opposition Labor party’s planned changes to tax breaks for property investors, CoreLogic’s head of research Tim Lawless said. The top end of the market is taking the biggest hit, as banks become more cautious in lending to borrowers with high debt levels and a surge in first-home buyers funnels demand toward the bottom rungs of the property ladder.